HM Digital instruments what is it? Where to buy Testers HM Digital ? Discover the company HM Digital and its creation, HM Digital is established in 1987, HM Digital, Inc. . (formerly known as Heemang Electronics) is an equipment manufacturer to test your water and your nutrient solution now recognized worldwide for providing the best value, the most reliable in the test instrumentation, test your water and nutrient solutions for the hydroponics , especially the counter TDS , EC increasingly popular on the accuracy of electronic instrumentation market. Products and Testers HM Digital are designed in close partnership between the Los Angeles office in California and our factory certified ISO-9001 in Seoul, Korea, HM Digital product testing equipment and high quality water monitoring for all types of treatment and water purification systems including reverse osmosis that is to say as the RO water with the reverse osmosis GrowmaxWater or Aquariopure . 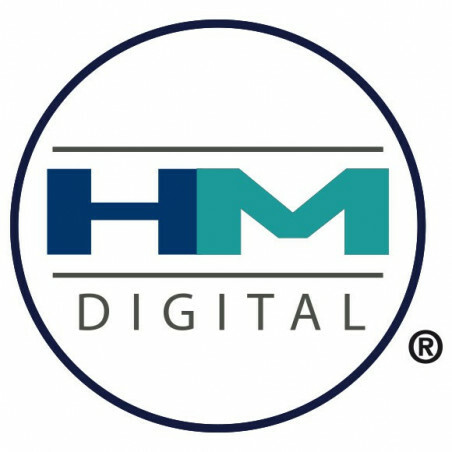 HM Digital sells its products to over 50 countries around the world. HM Digitaloffersalso OEM services for customized products and private companies, if you want to make private label that is to say, a private label to your image. it is in 2000 that the office of the United States was established in Los Angeles, California , to provide and develop marketing, customer service and distribution for the Americas, Europe, Africa, The Middle East, Australia and South Asia. We strive to always provide the best values ​​and the utmost care to quickly serve our distributors and our customers. HM Digital in selected Culture Indoor as exclusive distributor official in France since 2010, if you are looking for a wholesaler, distributor, stockist, a distributing warehouse HM Digital in France contact or visit Culture Indoor leader of hydroponics and aeroponics. Our portable HM Digital controllers as models TDS, EC, pH, ORP, online monitors, controllers and accessories for water filters reverse osmosis water purification systems, hydroponics, aquariums, pools and Many other applications are superior in terms of construction and performance, still available at a very economical cost. HM Digital, Inc. . Is the only manufacturer of economical online TDS monitors that measure total dissolved solids (TDS) levels of feed and product lines at the same time, an effective way to compare rejection rates and calibrate the osmosis membrane Reverse, purification of water. 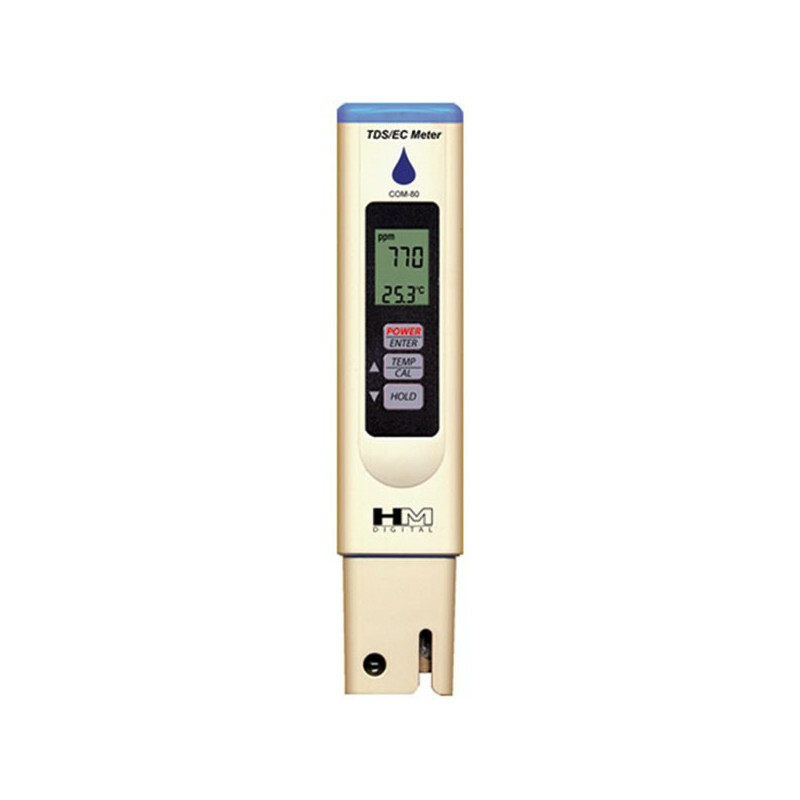 With the water test instruments HM Digital, you will know if your water is pure. 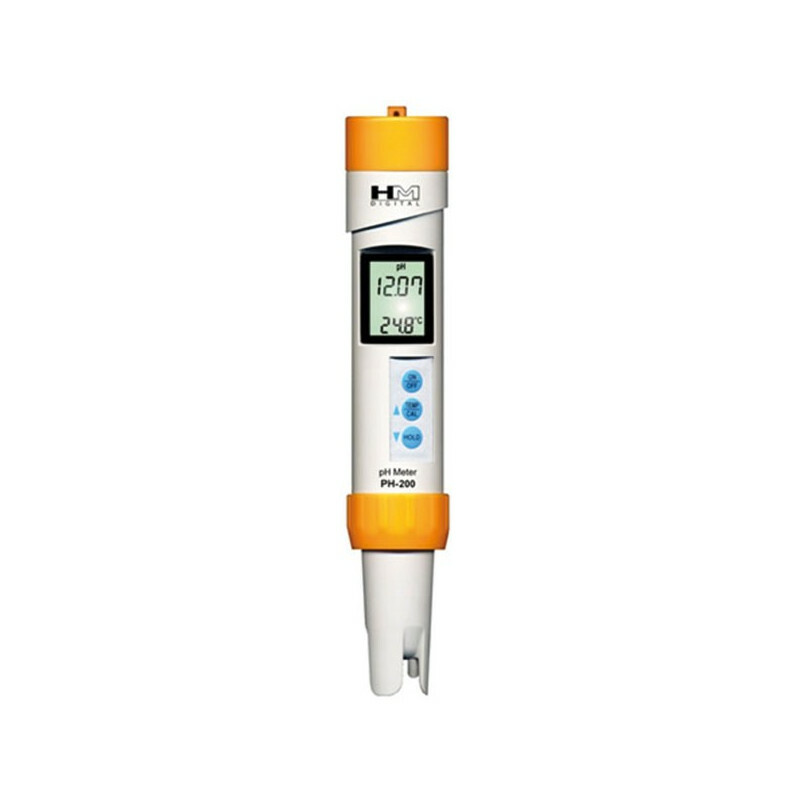 Please click on the products HM Digital to learn more about what PH tester or EC is right for you. What is a PH tester and what is the electrical conductivity and the EC ? The EC-3M is an electrical conductivity tester cell that measures the electrical conductivity with a range of 0 to 9.99 millisiemens (mS). It includes a built-in digital thermometer and an easy-to-read LCD screen and a convenient vinyl cover with belt clip. Our pH electrodes storage solution is ideal for extending the life of the probe on your pH-200 and PH-80, while our pH buffer solutions in single solution provides a simple and convenient way to calibrate your (your ) Counter (s) at pH 4,00 & PH 7,00. Visit our pages on electro-conductivity. What should be the level EC of my water? There is no specific level or "good or bad" answer to this question. In general, for drinking water, a lower level of EC (purer water) is preferred. The US EPA, all US states, the World Health Organization (WHO) and most countries impose maximum limits on authorized CWs in drinking water. These limitations are typically 500 or 1000 ppm, but they vary. There are no known minimums for drinking water. How can I take care of your EC tester ? Why do I experience different readings in the same water with the same meter? The nature of the positive charged ions (which is what the TDS meters measure) is that they are always moving. Therefore, there may always be variances in the conductivity, and thus a different reading. Even with ATC, which means temperature compensation, temperature changes of a tenth of a degree can increase or decrease the conductivity. In addition, the temperature coefficient (which the reading is multiplied by to adjust the temperature differences) varies slightly depending on the ppm range. Our meters and virtually all meters under 500 € have a single temperature coefficient, regardless of the range. The new COM-100 offers three temperature coefficient of options, but each is linear once selected. Air bubbles Even a small air bubble that adhered to one of the probes could potentially affect the conductivity, and thus the reading. Continuous electric charges Electric finger loads, static electricity out of clothing, etc. On the meter and persistent electrical charges in the water will affect the conductivity of the water. Knife / cup of material Plastic cups retain persistent electrical charges more than glass. If the meter touches the side of the glass or plastic, it may take a light load. If the plastic retains a load, it could also affect the water. Changes in Volume The amount of water in the sample can affect conductivity. Different volumes of the same water may have different levels of conductivity. Displacement can also affect conductivity. Positioning of the probe The depth and position of the probe in the water sample can also affect the conductivity. For example, if a meter is immersed in water, removed and immersed in water again, but in a different location, reading may change. How do I get the best possible readings? Shake Always make sure to shake the excess water out of the meter before soaking it in a water sample, even if it is the same water. Shake / type After immersing the meter in water, always lightly tap against the side and stir the meter to remove any persistent air bubbles or electrical charges. Positioning When you take the reading, always make sure to hold the counter upright without touching the sides or bottom of the glass / beaker / cup. The probes should be hung as close as possible to the center of the water sample. Time The longer the meter is in the water, the more accurate the reading will be. Temperature 25 degrees Celsius is the ideal temperature for conductivity readings even if the counter to ATC. Rinse If you are going from very low to very high water, always rinse the probes with distilled water to avoid accumulation. Can I use the cap as a receptacle for testing ? No. The cap is reserved for storage and protection. For best results, use a larger beaker, cup, glass, etc., so there is a larger volume of water that will be tested. In addition, to ensure a long life of your product, TDS / EC sensors must be stored dry. Are TDS meters really conductimeters? Yes. While EC and TDS are often used interchangeably, there are some important differences to note. EC , when applied to water, denotes the electrical charge of a given water sample. TDS refers to the total amount of substances in water other than H2O pure. The only true way to measure TDS is to evaporate the water and weigh what remains. Since it is almost impossible to do for the average person, is it possible to estimate the level of TDS by measuring the EC water. Each meter TDS digital in the world is actually an EC meter. All the elements have a certain electrical charge. Therefore, it is possible to closely estimate the amount of TDS by determining the EC water. However, since different elements have different loads, it is necessary to convert the EC to TDS using a scale that mimics the burden of this type of water. KCl Potassium chloride is the international standard for calibrating the instruments which measure conductivity. The COM-100 is factory calibrated with a solution of 1413 microsiemens is the default mode is EC-KCl. The conversion factor of KCl is 0.5-0.57. 442TM Developed by Myron L Company, 442 TM simulates the properties of natural water (rivers, lakes, wells, drinking water, etc.) with a combination of 40% sodium bicarbonate, 40% sodium sulfate and 20% chloride . The conversion factor 442 is 0.65 to 0.85. NaCl Sodium chloride is used in the water where the predominant ions are NaCl or whose properties are similar to NaCl as sea water and brackish water. The NaCl conversion factor is 0.47 to 0.5. The measures in EC (ĩS) do not have a conversion factor, but require the correct setting of the appropriate temperature coefficient. Most HM digital TDS counters other than the COM-100 use the NaCl conversion factor (mean 0.5). Some products are available with conversion factor 442. Is the exact precision always necessary to test the TDS or conductivity? Usually not. TDS is primarily on the range. For the majority of industries that require testing TDS , such as drinking water, aquaculture, hydroponics , etc., it is more important to your TDS levels to be within a certain range. There are some industries that require a precise ppm level, but this level is almost always zero. With the exception of colloidal silver, there is never a time when someone needs an absolute and precise level of TDS in drinking water. What is the difference between a parameter and a scale? A parameter is the measured characteristic. A scale is a particular range applied to the measurement of this parameter. For example, temperature is a parameter. Fahrenheit or Celsius is a scale. Does " EC " is a parameter or a ladder? "EC" is a parameter. It is synonymous with electrical conductivity. There are a number of scales used in the EC , usually micro-Siemens (μ S) or milli-Siemens (mS). For example, if a particular application requires water with "2.0 EC", this is an incorrect determination. Most likely, the application requires a level EC of 2.0 mS. 2.0 mS = 2000 μ S.
What is this little symbol μ on my tester EC ? The symbol 'μ' is not a tiny U, but the Greek letter Mu. It is the micro abbreviation, and when used with an S (μ S) is synonymous with mirco-Siemens, which is a scale used to measure the EC. How can I convert CE (μ S) TDS (ppm)? The best thing to do is to use a TDS counter, which will automatically make the conversion. EC meters do not use conversion factors because there is no conversion. To convert to TDS, if you do not want to use a TDS meter, you will need to determine which conversion factor you want to use (NaCl, 442 or KCl) and do the calculations. Can a TDS tester be used to test water softeners? No. Water softeners do not retain TDS. Instead, water softeners work through an ion exchange process. As water flows through the water softener, it will pass through a resin, a bed of small plastic beads or a chemical matrix (called zeolite) that will exchange calcium and magnesium ions with the ions Sodium (salt). Therefore, the TDS level will remain virtually constant (there may be minor differences). How can I convert TDS ( ppm ) in EC ( ĩS)? The best thing to do is to use an EC meter. If you know the conversion factor used by your meter, you can do the calculations. 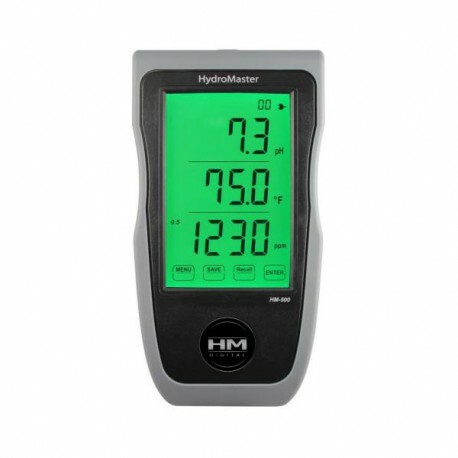 Most digital meters HM use NaCl conversion factor, an average of 0.5. Therefore, if you use a meter TDS with NaCl conversion factor, multiply the reading by two, which will allow you to get a close approximation of the EC level. What is the EC-to-TDS conversion factor used by HM digital TDS counters? Most counters TDS digital HM using the conversion factor NaCl EC-to-TDS, an average of 0.5. Some testers HM Digital, such as COM-100 have selectable conversion factors, so you can choose the one you want to use. For specific counters, please contact HM Digital. It is believed that mineral waters help provide elements for body metabolism. However, there is scientific evidence to suggest that most of these minerals are in inorganic (dead) form. While they may enter the circulation, they can not be used in the physiological process of building the human cell. With this in mind, we can see that mineral water can give "dead" or "inorganic" minerals to the body that can not be properly assimilated. These inorganic minerals only interfere with the delicate and complex biology of the body. The body's need for minerals is largely satisfied by food, NOT DRINKING WATER. Organic minerals in tap water represent only 1% of the total mineral content of water. A glass of orange juice contains minerals more beneficial than thirty gallons of untreated tap water. Only after their passage through plant roots that these inorganic minerals become organic (photosynthesis) and capable of being assimilated to our tissues as Minerals Bio . Pure water removes inorganic mineral deposits in your body . Organic minerals are completely absorbed and remain in your tissues. According to many nutritionists, minerals are much easier to assimilate when they come from food. Can you imagine going to your garden for a cup of dirt to eat rather than a nice carrot; Or drink a whole tub of water for less calcium than in an 8 ounce glass of milk? How often should I calibrate a pH or ORP meter? All pH testers and ORP must be calibrated frequently. For best results, HM Digital recommends calibrating the pH-ORP-200 and the 200 at least once a month. This may vary depending on the frequency and type of use. For example, if you test a wide range daily, for the most accurate measurements, you need to calibrate your testers every day. At what level do I calibrate my pH meter ? A pH meter must be calibrated as close to the level that will be tested. The most common pH buffers are 4.0, 7.0 and 10.0. If you test a range then you need to calibrate the middle of this range. At what level do I calibrate my meter ORP? A tester ORP should be calibrated as close as possible to the level that will be tested. However, a negative buffer ORP does not exist in nature. The reason for this is that when it is exposed to air, the milli-voltage will begin to change, affecting reading. Therefore, an ORP counter can only be calibrated to a positive ORP level. If you are testing negative levels, calibrate as low as possible. If you are testing a track, then you need to calibrate in the middle of that range. Should I expect a precise accuracy with my PH-200 ? Yes, in the specified accuracy, and if properly calibrated. Should I expect a precise accuracy with my ORP-200 ? In the positive range, yes, in the guaranteed accuracy indicated, and if properly calibrated. In the negative range, obtaining a point precision is virtually impossible because the meter can not be calibrated on a negative buffer ORP and also because ORP negative will naturally change quickly. Therefore, searching for a range of negative values ​​will produce more effective test results. No. The cap is reserved for storage and protection. For best results, use a larger beaker, cup, glass, etc., so there is a larger volume of water that will be tested. In addition, in order to ensure a long service life of your product, pH / ORP sensors should be stored moist, in the appropriate electrode storage solution. How can I get better negative measures with my ORP-200 ? A low oxygen (negative) content of water can be rich in minerals that can adhere to the platinum band on the sensor. If you find that the ORP-200 is slow or unaffected by the ORP's negative water, you may need to clean the platinum tape. How can I take care of my PH-ORP-200 or 200 ? For best results, always make sure that the sensor is saturated in the storage solution solution (included in the cap and the extra bottle). For best results, store standing meters to ensure complete saturation. Rinse the sensor in distilled water after each use, especially if you are testing water and high TDS water content other than water. For best results, store standing meters to ensure complete saturation. Calibrate frequently. The pH and ORP sensors should they be stored in water? Yes . The sensors must be stored in the appropriate storage solution. For best results, always make sure that the sensor is saturated in the storage solution solution (included in the cap and the extra bottle). For best results, store standing meters to ensure complete saturation. There is a white residue on my cap or my sensor. Is this normal? Yes. The white residue is the salt deposit of the storage solution, which is very high in salt concentration. Simply wipe the salt with a handkerchief. Never touch the sensor glass with your fingers. What should I do if I experience unusual readings? For both 200 and PH-ORP-200, it is because your meter should probably be calibrated, the sensor is dirty or the sensor must be saturated in the storage solution. 1. Rinse the sensor in distilled water. 2. Store the sensor in the storage solution (with the meter upright). 3. Recalibrate your meter. 4. ORP-200 , clean the platinum band with a silver polishing tape. Why the PH-200 or ORP-200 does not he stabilizes in distilled water? PH and ORP sensors react conductivity. Therefore, they will not stabilize in distilled or pure water. If you need to use the meters in distilled water, swirl the meter slightly in the water until the reading stabilizes. It will begin to stabilize after about 30 seconds. My PH-200 does not calibrate . How can I fix this? Sometimes, after use without regular calibration or within wide ranges, the PH-200 may incorrectly calibrate to the wrong value. In this case, perform a "master reset". Instructions for master reset can be found on page 5 of the user's guide, marked as "For advanced users only." What should be the pH or ORP of the storage solution? You will not be able to get an accurate reading about the storage solution because it may not be enough, there is a sponge in the cap, and the value of the solution will be quickly corrupted by other liquids. You should not attempt to calibrate the storage solution. The only purpose of the storage solution is to keep the electrodes saturated. For calibration, always use a buffer pH or ORP certified laboratory.